Welcome to the ‘Little Girl’s Bedroom Makeover’ series! I’ve written a selection of tutorials that really fit in well with a bedroom makeover! And I thought I’d share them here in one central location. They’re all very easy and straight forward. They’re also customisable and of course, easily adapted for boy’s bedrooms too! I’ve also been collecting inspiration on Pinterest. I can lose hours browsing on there! If you’d like to follow my ‘Girls Bedroom Ideas’ board you can see it HERE. 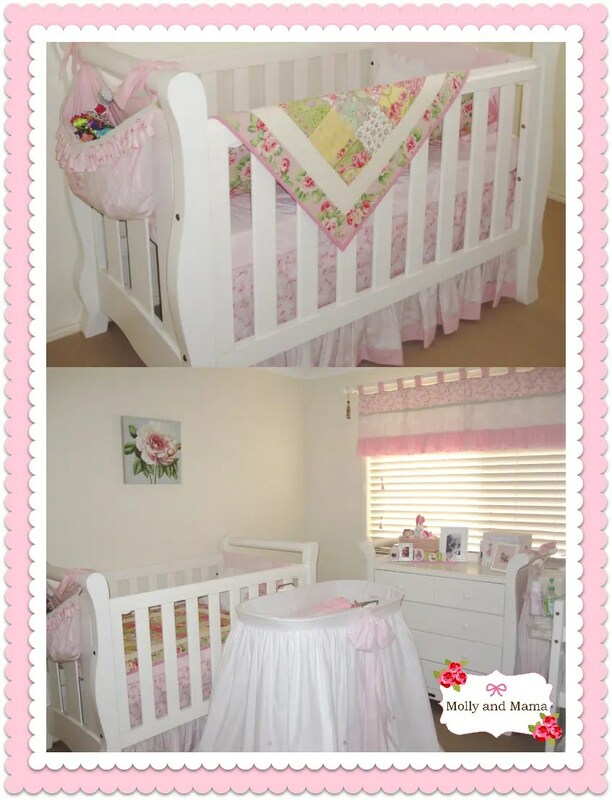 A few years ago, my mum created the most stunning nursery set when we found out I was expecting a daughter (the first grand-daughter too). It was frilly and pretty, floral and sweet. She created every piece, except the cot quilt (my very first quilting project). So in keeping with that theme, I’ve planned similar items that will work well in my daughter’s room now. For my first tutorial, I decided to start with something simple but beautiful. So I put together a very easy to follow tutorial explaining how to create a pretty pillowcase using lace and trims. You can create your own by following all the steps in my tutorial. It seems that every little girl has a LOT of hair clips, hair bows and accessories. Here’s a very simple no-sew project that helps you create a beautiful piece of wall art that’s very practical too; the Molly and Mama Hair Clip Holder. The next tutorial uses a wooden embroidery hoop. These practical pieces have certainly seen a resurgence in recent times. And it’s lovely to see them being used in new and alternative ways. For this project, I used some stunning Liberty lawn and pretty ribbons to make a personalised head band holder. My Chloe has a hair clip holder that can display oodles of her beautiful hair pieces. But her poor old head bands were hiding away in the cupboard. Not any more! Pop over HERE to find out how to create this project, with step-by-step instructions and lots of photos. This tutorial is another variation on a personalised pillowcase. Simply embroider your favourite design onto a pre-made store bought pillowcase. It’s easy to transfer your design using an iron-on transfer pen. This pen has changed my life! If you’d like to read the tips and tricks for creating this easy project, stop by HERE. Next in the bedroom makeover series, is a practical little post about making a cute bed pocket for books and bed-time teddies. This pocket is a terrific home for cuddly toys during the day, and it’s also a nice place to store a book so it’s handy for bedtime stories in the evening. You’ll need to pop over to Sew McCool to view the full tutorial. It’s surprisingly easy, and it’s also a great introduction to many of the techniques used in quilting! I hope you find some bedroom inspiration here. For more Molly and Mama tutorials, pop by the Tutorials tab. There’s lots to see! I’d love to see what you create, so please share your projects too!